Remember your world can only reflect what is within you. Is it that the world is more insane, or is it that you are simply more aware of it? Are videos, music, and internet an expression of the consciousness of humanity from the sublime to the ridiculous to the detestable? You cannot hide yourself or your children from these influences without an anchor, a firm footing. So, what is the anchor for you and for them? The answer is simply self awareness and acceptance of your true identity. How did the individual identity diminish? There is no greater power; there is no collective source in all the world that is greater than one single conscious awareness. You know and hear and see things as they occur. You have greater awareness of the collective whole. It is imperative to stay anchored and focused. You see and hear humanity’s triumphs and tragedies. It is chaotic and confusing for the best of participants. What of young minds? You would not send our children across the street without teaching them how to be observant and safe. You speak to them of being aware of strangers. You instruct them on who should be their friends. Although, you do not instruct them on the world they are entering, possibly because you yourself do not know how to evaluate its snares. We give you this information to assist you in understanding the struggles of all humanity, particularly voiced in your youth — the intensity of the world, the fragility of the human spirit without meaning. These are the truths you have learned. You know what gives meaning, you understand it is your creation. You are able to see the victim and the victimizer as one. Humanity is going to be calling out more than ever for words of meaning for the seeming madness of their minds. At the same time, the power of love, the power of insight, of understanding and wisdom permeates the globe seeking its eternal dance to balance these negative influences. When one becomes overwhelmed by their environment, they feel worthless. The more you are overwhelmed by that which is around you, the more helpless and worthless you perceive yourself. An analogy to the deafening din of input into the individual mind is a hearing person turning up a hearing aid in a symphony. We have spoken in times past of a center point in the center of your mind, it is the one place, the one point of power to still the chaos. There have always been horrors, there have always been violent storms, there have always been catastrophic events in human history, but never, never, has humanity so instantaneously been made aware and participated in these events. What occurs when you watch so much human suffering–a tsunami, Katrina, wars–it is imprinted upon your soul, heart, mind and then you see a commercial for laundry soap. How do you cope? How do you respond to that input? The world becomes meaningless, illusory. What has occurred is that technology is ahead of human psychic development. 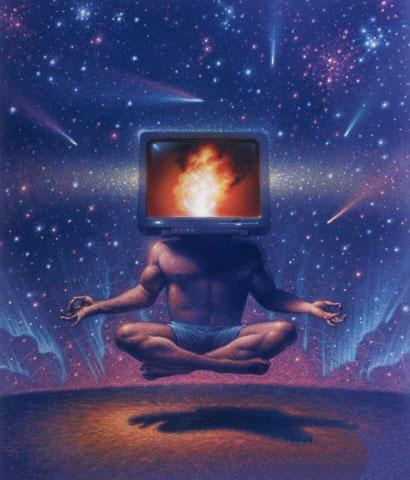 We are getting the information without the Consciousness to appropriately respond. Humanity has become aware without its awareness of Oneness. Humanity is observing itself without the individual being aware of that fact. Indeed, there is a collective whole in which humanity jointly participates. Individuals who observe events such as Littleton, Oklahoma, 9/11 create a collective consciousness, which affects the greater conscious. The key is for each individual to value themselves. The violence in your culture devalues the value of human life. The inundation of your psyche with these images of violence becomes an issue. Any act of violence is a direct assault against yourself. So in summary, humanity is overwhelmed, and therefore, desensitized and feels helpless–and therefore, worthless. The answer is the reestablishment of individual self worth. The power of one. And the power of many ones.